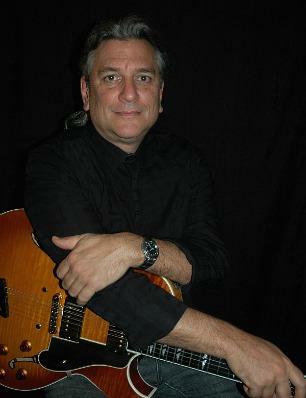 Guitarist Vincent Venezia is a talent on today’s contemporary music scene. He began playing guitar at age eight, studying with various instructors from his hometown of Cliffside Park, New Jersey. Accomplished in several styles of music, he is a veteran of Broadway and European tours and works steadily in the tri-state area as a leader, sideman and composer since graduating William Paterson College with a degree in Jazz Studies and Performance. Vincent was instructed by the best performers of our time: jazz guitarists Bob DeVos, Harry Leahey and classical guitarist Leonid Bolotin. The National Endowment for the Arts awarded Vincent two consecutive fellowships to study with modern jazz star Mike Stern. Some of the greats he has performed with include: Kermit Driscoll, Lincoln Goines, Harvie S, Richie Morales, Cameron Brown, Steve Marcus, Steve Johns, Lew Soloff, Steve LaSpina, Gerry Niewood and Doug Weiss. Vincent writes compositions for jazz ensemble and solo guitar with influence drawn from Wes Montgomery, Pat Metheny, Jim Hall, John Coltrane, Bill Evans and Miles Davis. His broad knowledge within the jazz tradition yields a musical voice with exciting results. He looks forward to performing music in more challenging creative situations. Watch for Vincent's debut record 'Fifth and Adams', Featuring:Richie Morales, Harvie S, Kermit Driscoll, David Budway, Bob Magnuson, Manolo Badrena and Mike Stern.